Following heat treating cycles, many industries now require additional treatment to further reduce metal fatigue. 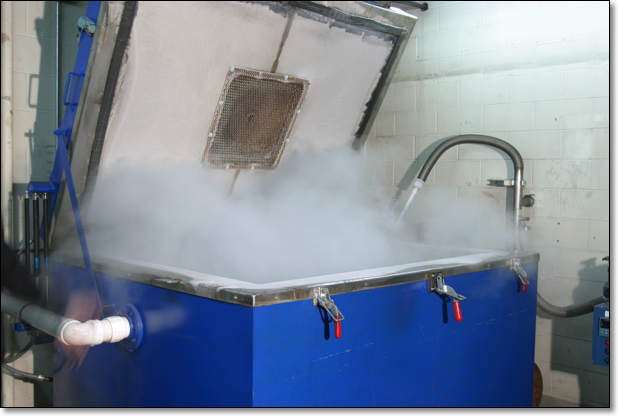 While many heat treating facilities refer to sub-zero cooling (-100F) as cryogenic treatment, true cryogenic processes are carried out below -250F. Applications include gears, pinions and engine blocks in the racing industry. With cryogenic treatment fatigue is lower, reducing repairs and replacements for high-stress applications. Studies show that tools treated at -300F can last 2 to 3 times longer than tools produced with sub-zero cooling. © 2019 Metal Treaters Inc.